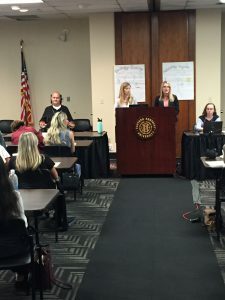 HDI and HDI CATS are launching an ADA Training series to be held on the fourth Thursday of each month covering different topics surrounding the Americans with Disabilities Act. This month's presentation is "Accessible Technology & the Workforce: AT as a Reasonable Accomodation." This year's conference theme is "Resources in the Real World"
Share our Save the Date flyer with your colleagues, patients, caregivers, and others! 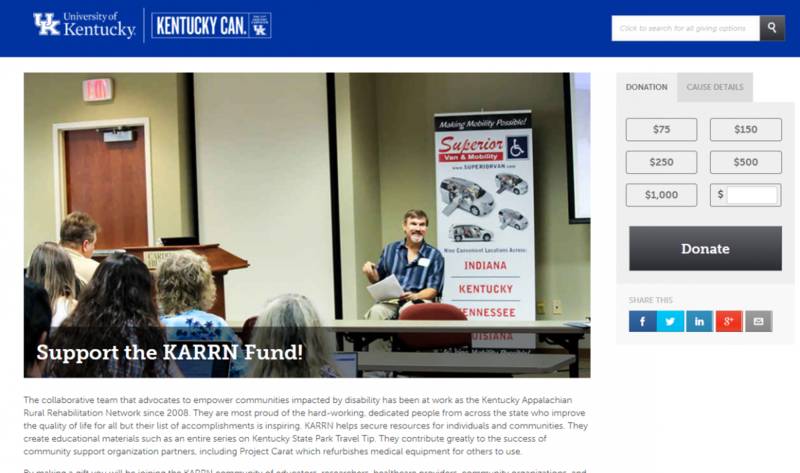 LEXINGTON, Ky. (Dec. 10, 2018) — The Kentucky Appalachian Rural Rehabilitation Network (KARRN) has spent the past decade investing in citizens of rural Kentucky who have experienced a neurological condition such as a spinal cord injury, stroke, or traumatic brain injury. Their collaborative team has transformed countless lives by helping survivors improve quality of life and reintegrate into their communities. 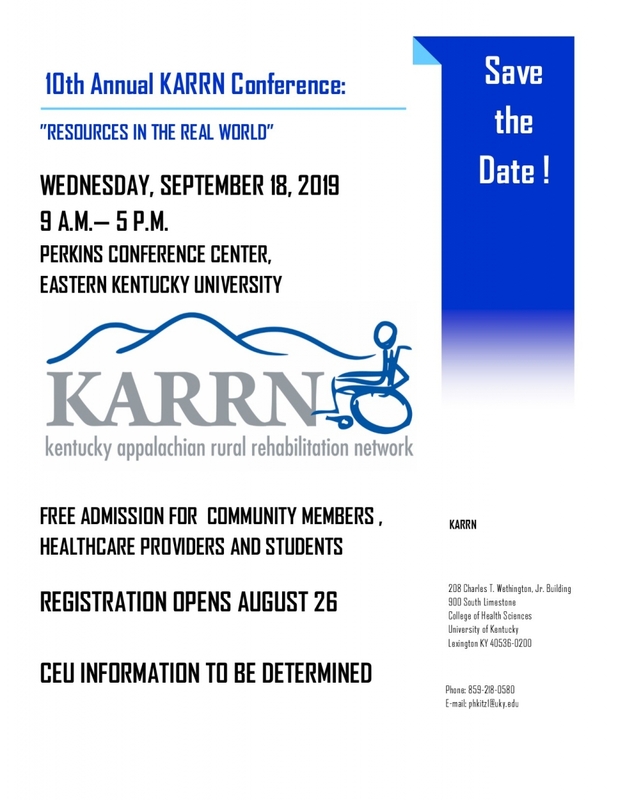 The idea for KARRN began as a question posed by founder Pat Kitzman, associate dean for research in the University of Kentucky College of Health Sciences, and KARRN co-director Beth Hunter, assistant professor in gerontology at the UK College of Public Health. Patients are treated for a neurological injury and recover to the point of being sent home, many to a rural Kentucky community with limited services. What then? How do those with life-changing neurological conditions fare once home? in deep Eastern Kentucky, where access to health care services and support is minimal. 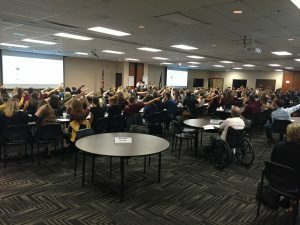 “Mark and Tonya are founding members of the monthly Hazard stroke support group and also participate in KARRN’s community research team,” Kitzman said. The Hazard support group is open to all people who may be impacted by a loved one or friend’s neurological injury. Caretakers are encouraged to participate even if their survivors do not come. Families and friends are always warmly welcomed and supported. As part of KARRN’s community research team, the Kincaids give input on how health care professionals can help stroke survivors and caregivers in the wake of their diagnosis. One of their ideas—a notebook for the caregiver to record doctor’s names, medications, thoughts, questions they need to ask, details they need to know for care, etc.,—has already been implemented successfully. In April 2011, Carolyn’s Wallace’s then 18-year-old son, Aaron, was the victim of a motor accident that left him with a severe brain injury. Aaron wasn’t expected to survive the night and spent a month in the ICU at UK Chandler Hospital. The Wallaces call Madison County their home and reside between Berea and Paint Lick. Living in this rural area, they almost never traveled to Lexington. All that changed after Aaron’s accident. Aaron was then moved from Lexington to Louisville to attend a brain rehab center which put the Wallaces even farther from home. Eventually, he was accepted into the Kentucky Transitions program which brought him back to Lexington, and shortly after, to the services at KARRN. As Aaron began to progress in his recovery, Carolyn wondered if he might be able to communicate again. 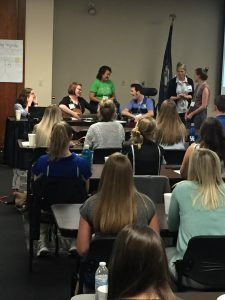 After a conversation with Kitzman, they decided to try and implement speech-language interventions and music therapy through the UK College of Health Sciences Communications Sciences and Disorders (CSD) program. Through the years, the Wallaces have stayed connected to KARRN as panel members for severe traumatic brain injuries at various events and conferences. Last year, they were responsible for a full-hour session at KARRN’s annual conference about how speech and music therapy work together. 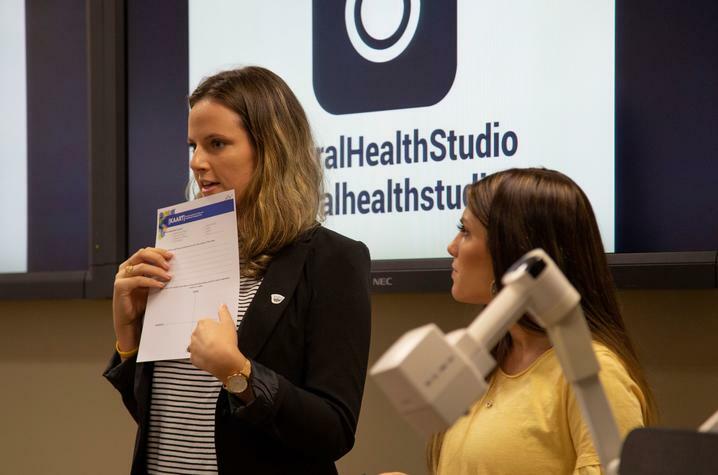 Emily Lopez (left) and Scarlett Bickett (right) present a workshop design for the Center of Excellence in Rural Health in Hazard, Kentucky. LEXINGTON, Ky. (Oct. 31, 2018) — At 500 million years old, Appalachia is one of the oldest environments on Earth. It stretches from southern New York through northern Mississippi. The region contains the entire state of West Virginia and portions of 12 other states including Alabama, Georgia, Kentucky, Maryland, Mississippi, New York, North Carolina, Ohio, Pennsylvania, South Carolina, Tennessee and Virginia. The University of Kentucky College of Design sits on the doorstep of Appalachia. Proximity to the region inspired the College of Design to establish Studio Appalachia as a catalyst for a positive change by means of community engagement. Studio Appalachia pursues design research projects that address issues that have confronted the Appalachia region for decades. Faculty members Gregory Marinic, interim director of the School of Interiors and director of graduate studies, and Assistant Professor Rebekah Ison Radtke collaborated on one of the first Studio Appalachia projects in Williamsburg, Kentucky. Taking cues from Appalachian history and geography, their studio explored interventions to existing building façades, outdoor spaces and interiors. Students investigated the renewal of existing buildings through the lens of preservation, intervention and transformation of utilitarian “everyday” structures. The project yielded three-fold outcomes — the development of a foundational body of Appalachian design research, the curation of an exhibit in Williamsburg, and the conceptual design of a future Studio Appalachia web portal. At the urban scale, reimagining the central core of downtown Williamsburg offered an opportunity to serve multiple user groups of various abilities, generations and socioeconomic backgrounds. Students implemented a comprehensive analysis of geographic, cultural, historical and demographic aspects of the broader Appalachia region. At the beginning of the semester, students collaboratively developed a broad-based survey of Appalachia, a 12-town region in Southeastern Kentucky, and downtown Williamsburg. Students identified sites in downtown Williamsburg for intervention. “These projects are not just valuable for the students but equally valuable for the community. It’s a mutually beneficial relationship that provides students a great learning experience, while applying design research that will impact Kentucky,” Radtke said. Students in Studio Appalachia often use grants to help fund their projects or to pitch their ideas to the communities that seek additional funding. Thus far, Studio Appalachia community outreach work and speculative proposals have also been completed in Butler, Harlan, Williamsburg and other towns in the Ohio Valley region. Monthly peer support group, primarily individuals who use wheelchairs or experience paralysis, and others interested in issues affecting this population. 2358 Nicholasville Rd, Suite 180, Lexington, KY 40503. Monthly peer support workshops centering on goal setting, problem solving, and maintaining a healthy life while reaching your employment goals. For more information, contact emily@ipky.org. Recruiting participants and requesting feedback about this program from attendees at Let’s Roll Kentucky’s event at IPKY. Monthly presentation on various aspects of the Americans with Disabilities Act, presented by Jason Jones. Next session: January 24, 2019 from 10:00-11:00. Register here. 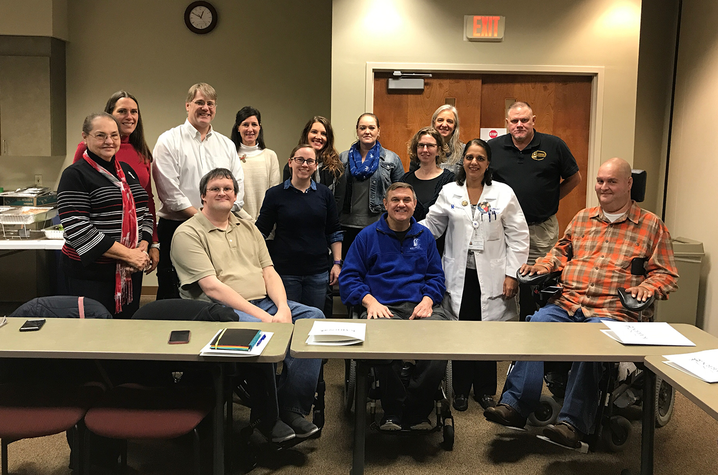 The mission of the Kentucky Congress on Spinal Cord Injury (KCSCI) is to gather individuals with paralysis and those interested in issues affecting them from around the Commonwealth to discuss issues and advocate for changes to improve life for people with paralysis. If you’re interested in getting involved with KCSCI, please contact ryan@ipky.org. 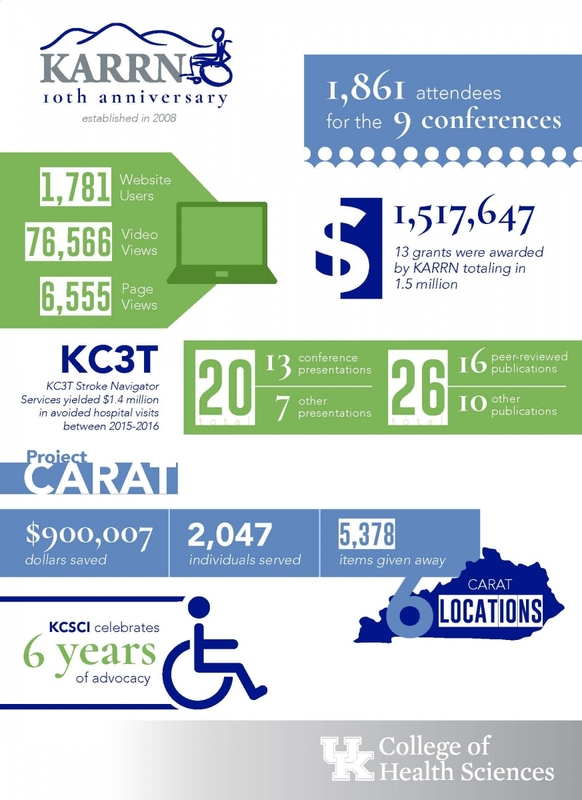 IPKY and KCSCI are working to build a peer support program with the staff at Cardinal Hill Rehabilitation Hospital. If you have a spinal cord injury and are interested in becoming a peer mentor, please reach out to ryan@ipky.org. 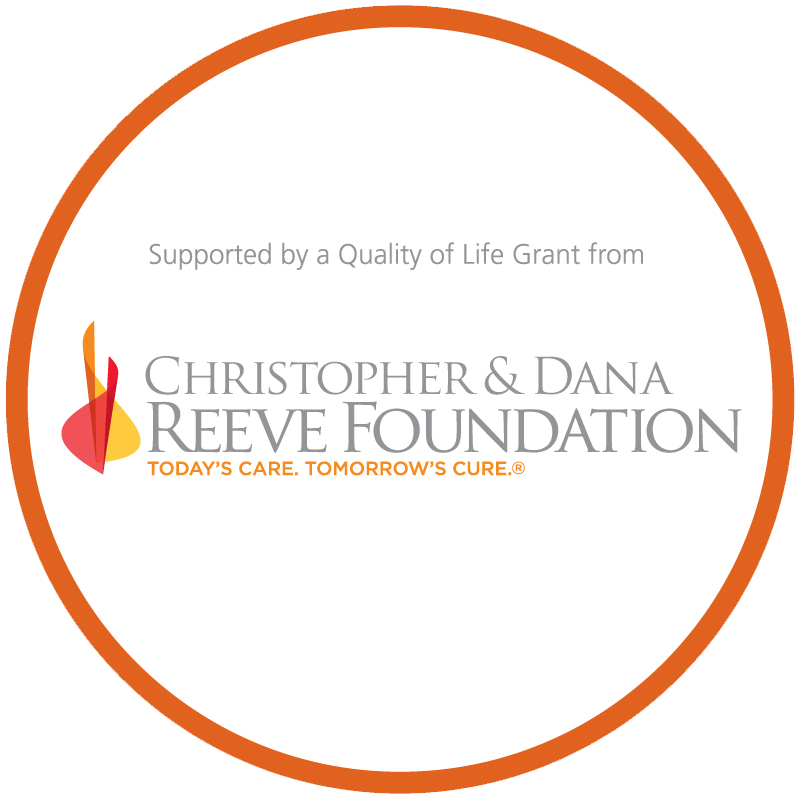 **IPKY programs supported in part by a grant from Christopher & Dana Reeve Foundation. For more information about our IPKY programs, please email Ryan Guyder or Emily Nugent! You can also reach their office by phone at 859-266-2807. We are excited to announce that UK’s College of Health Sciences is including KARRN as one of several options for financial donors to earmark as they donate to the college. It is an honor to be recognized for our prior contributions and to be added as a recipient of UK CHS support from alumni and friends. As you know, we are a community-based group and funding can be tight. These funds will support our educational programs, equipment for our community members, our advocacy initiatives and other projects developed by our KARRN group. Please share it (privately by individual emails, or through Facebook, etc.) with anyone who you think may be interested in supporting our ongoing and future programs! 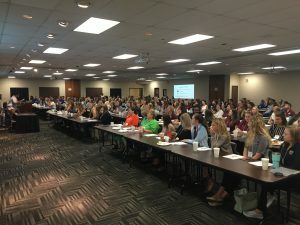 Our annual conference on August 24, 2018 drew a larger than usual audience, with 227 in attendance. Thank you to our speakers! We have their PowerPoint presentations available below. Conference attendees can expect complimentary breakfast and lunch during the event, as well as refreshments throughout the day. There will be a vendor area for you to view new products, technologies, services, and demonstrations before, during, and after event speakers and breakouts. Attendees will also be given the opportunity to meet new people and engage in the discussion that is critical to the SCI world and the disability community as a whole. All of this and more is completely free to you as an attendee. We hope that this gift is as meaningful to you as it has been to those of us who have benefited from the work and support of the Kentucky Congress on Spinal Cord Injury. KCSCI strives to create a culture where consumers become strong advocates for the rights of all people with disabilities and are willing agents who provide peer mentoring to the SCI community. The 2019 CAF Grant Application is now OPEN! The deadline to submit your grant is Friday November 2nd, 2018 at 5PM PST. For any questions, email cafgrants@challengedathletes.org. The ABLE (Achieve and Build Lifetime Empowerment) group meets on Monday, June 25 at 11:15 in the Fellowship Hall at Berea Baptist Church (310 Chestnut Street). Parking is convenient and the building is handicapped accessible. This month will feature Nick Wallace as a guest speaker, and he will present Financial Planning for Special Needs. The support group is free, volunteer, confidential and lowkey. It is for those with visible and invisible disabilities. Caregivers are welcome. All are encouraged to bring paper and pen and a snack and drink for yourself. A collaborative team that advocates to empower communities impacted by disability. Formed in 2008.